Please refer to our stock # lv1 when inquiring. This spectacular pin was custom made by Lawrence Vrba for Lush Life Antiques. 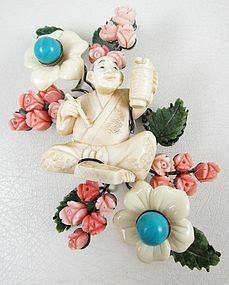 The pin measures 4 3/4" long x 2 1/2" wide and has an antique genuine pre ban ivory netsuke at the center. It has genuine angelskin coral flowers, jade leaves, and faux ivory flowers with turquoise stone centers. It has a Japanned finish and the reverse side has an oval "Lawrence Vrba" signature plaque. It is in excellent condition.